The mention of “Abish” and a “remarkable vision of her father” (Alma 19:16) is itself remarkable, since women and servants are rarely named in the Book of Mormon text. As a Hebrew/Lehite name, “Abish” suggests the meaning “Father is a man,” the midrashic components ʾab- (“father”) and ʾîš (“man”) being phonologically evident. Thus, the immediate juxtaposition of the name “Abish” with the terms “her father” and “women” raises the possibility of wordplay on her name in the underlying text. 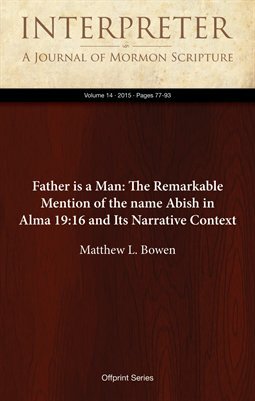 Since ʾab-names were frequently theophoric — i.e., they had reference to a divine Father (or could be so understood) — the mention of “Abish” (“Father is a man”) takes on additional theological significance in the context of Lamoni’s vision of the Redeemer being “born of a woman and … redeem[ing] all mankind” (Alma 19:13).